Know your rights. Know the law. Protect Yourself. Your first meeting with Matt Gould, at the offices of Brodsky & Company Barristers, is free. You can meet with Matt Gould, review your case, review your options, and determine how you intend to protect yourself against a criminal prosecution. Criminal defence representation requires more than just thorough preparation and legal research. There is an art to courtroom arguments. There are times for conciliatory negotiation, and there times when contested matters should be fought out in the courtroom. The key is finding the balance that will be most effective for your case. If you, or someone important to you, is charged with a criminal offence, effective representation can be the difference between going to jail, or going home. It can be the difference between losing your job, and keeping it. It can be the difference between a clean criminal record, and a record of conviction that can follow you and impact your life for decades. Getting charged with a criminal offence can be one of the most stressful situations one can be confronted with. That stress is understandable, because the outcome of a criminal prosecution can have a dramatic impact on whomever is charged. For someone who has never been involved in the criminal justice system, even someone charged with a relatively minor offence, getting a criminal record as the result of a criminal offence conviction can impact job opportunities, travel, and personal liberty. For example, a single impaired driving offence conviction will result in a criminal record that would be discovered through a criminal records check by an employer, or by American customs agents who have the ability to bar entry to the United States to anyone with a criminal record. 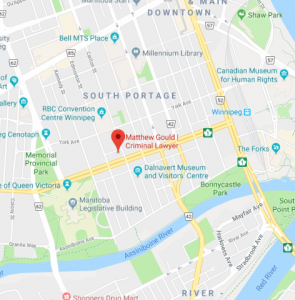 Matthew Gould is an experienced Winnipeg DUI lawyer, and can help you navigate this process and represent your interests. For an accused person facing more serious charges, such as weapons offences, assault charges, or many drug offences, the consequences of a criminal conviction can result in custodial jail sentences lasting years. The impact of a criminal prosecution can have such a significant impact on the person facing charges that it warrants careful thought and preparation. Time is of the essence. There are many aspects of the criminal justice system that move excruciatingly slow. Like any important decision, it is important to get informed at the earliest available opportunity. The first step is to meet with a criminal defence lawyer to understand what options are available, and how you intend to proceed. When someone is arrested and charged with a criminal offence, the police often have the discretion to either release the accused person, or remand him into custody. When someone is released by the police after being arrested and charged, that person will be issued a court appearance notice, and must appear in court on a specified date, or have a legal representative appear on his behalf. It is important be proactive if you find yourself with an upcoming first appearance court date. The earlier you speak to a criminal defence lawyer, the better prepared you will be defend yourself as an informed, knowledgeable, and protected accused person. If the police do not agree to release an individual who has been arrested and charged with an offence, that person will have to make a bail application in order to be released. Effective bail preparation and representation is critical to the defence of criminal prosecution. It is imperative to secure bail in a timely fashion to minimize the impact that an arrest has on the arrested person’s family, employment situation, and personal freedom. A criminal prosecution can take years to proceed through the criminal justice system. Securing release at the early stage of this process can be critical to the successful defence of a case at later stages of the process. From the first call on a case, to the last day in court, Matt Gould will represent you with the skill and knowledge required to get you results.